I met Shelley Berman in 1972. He was staying in Bernardsville, New Jersey — I think it was Mike Ellis’s house — and appearing in a production of Neil Simon’s Last of the Red Hot Lovers at the Paper Mill Playhouse in Millburn. Berman had become widely known because of his television appearances. His signature routine was sitting on a stool and talking on an imaginary telephone — a bit he put his stamp on before Bob Newhart used it in his own act. I had always thought of Berman as a kind of reiteration of Oscar Levant. I never met Levant, but Berman’s often dour persona reminded me of what I had read about the pianist-composer. I also think that certain points in their lives, they resembled each other physically. I found Berman to be articulate. I remember quite well the case he made about the damage critics can do to performers’ careers. It was something he had experienced himself and had thought a lot about; he could have made that argument before a jury. 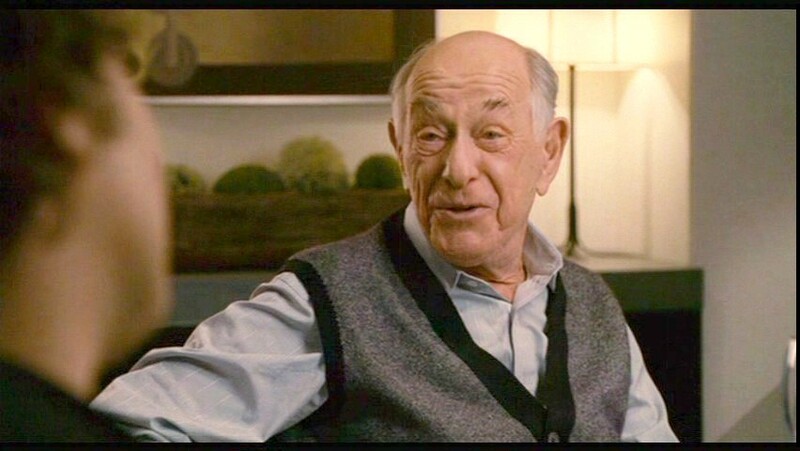 I bring up Shelley Berman because we saw him the other night in a 2006 movie, The Holiday. I watch movie credits right to the end, and that’s how I discovered that Berman was in the movie. He had a small role, and I hadn’t recognized him. He was 82 years old when he made that film. But when I saw his name in the credits, I went back into the movie to have a look. I wouldn’t have known him, but the point is that he was a perfect choice for the part he played. And that — the casting — is what makes this movie worthwhile. The Holiday, which was produced and directed by Nancy Meyers, is about two women who are unhappy in love. Iris Simpkins (Kate Winslet), who writes a society column for The Daily Telegraph of London, has been in love with a colleague for years. He is an affectionate and manipulative friend; he’s also engaged, and there is no prospect for him to return her passion. Meanwhile, frenetic Amanda Woods (Cameron Diaz), who owns and operates a lucrative Los Angeles company that makes movie trailers, finds out that her live-in lover has been having an affair with his secretary. Both women abruptly decide to take a holiday to assuage their anguish and, under the only-in-the-movies rule, they end up swapping houses. The outcome is exactly what you’d expect — in a movie. But although the plot is obvious and implausible, the casting decisions were impeccable and the result is a very entertaining movie. Winslet and Diaz are perfect as the ingenuous Iris and the frantic Amanda. Jude Law is disarming in an unusual role for him; he plays Iris’s brother, Graham,who makes Amanda’s visit to England worthwhile. 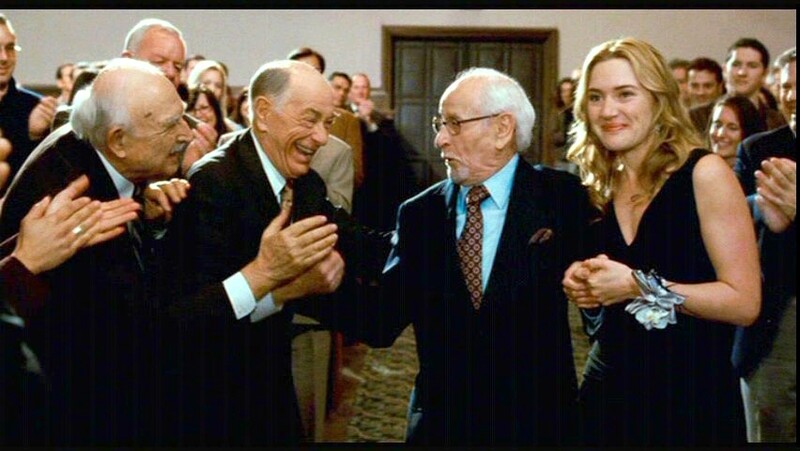 Eli Wallach, who was 90 years old when this film was shot, has a tour de force as Arthur Abbott, a retired screen writer with whom Iris develops a warm relationship that revs up the lives of both parties. Shelley Berman plays a buddy of Abbott. 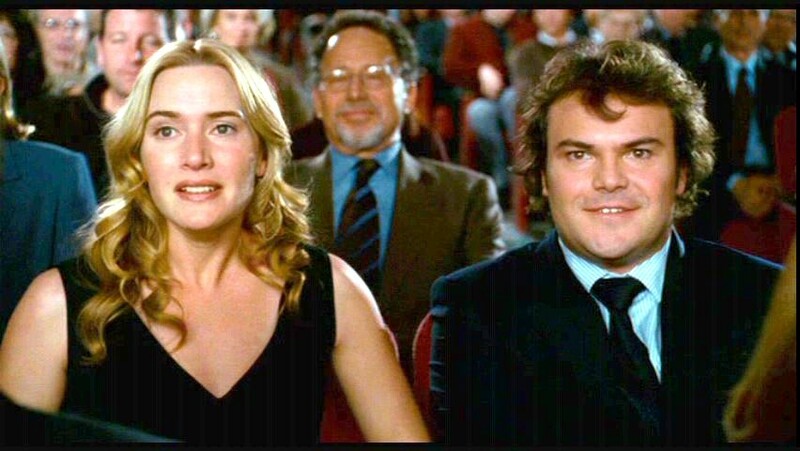 The most ingenious stroke of all was the choice of Jack Black as Miles, a sympathetic Hollywood composer who shares with Iris a weakness for the wrong lovers. The script was written with Winslet, Diaz, Law, and Black in mind. Any one of us could had written it, as far as the story line goes, and the reviewers had a few things to say about that, but the movie with its stable of charming characters still made money. Dustin Hoffman has a brief uncredited cameo in this film. It occurs when Miles and Iris go to a video store and are discussing The Graduate. Hoffman appears as a customer who overhears their conversation and reacts with a whimsical smile. Hoffman has said that he noticed all the cameras and lights at a Blockbuster store and stopped to find out what was going on. He ran into Meyers, whom he knew, and she wrote him into the scene. Shelley Berman performed one of his telephone routines on Judy Garland’s television show. It is introduced by Garland and a short musical number. To see it, click HERE. Paolino great review of some living legends who have not stopped working sounds like you and I. After a detour through some Shelley Berman monologues, I came back and really enjoyed the review. I’m not averse to an implausible plot in an entertaining movie, and this one looks especially entertaining. It’s on my list for cold-night-warm-slippers-nice-wine viewing.